Lent 1 "The Time is fulfilled"
Readings:Gen 17:1-7, 15-16; Romans 4:13-25; Mark 8:31-38. Our readings today all centre upon the scandal, the difficulty and absurdity of faith. We don’t see faith in these narratives, rather we see unbelief, misunderstanding and resistance. The great man of faith, Abraham: we catch him at a moment quite late in his story, where his relationship with God is quite advanced and fraught by doubt and misunderstanding rather than trust. Instead of trusting God, Abraham’s urgent desire to have a son has already caused him to make his own arrangements. He has set up a ménage a trois in his own household and Sarai’s servant Hagar has conceived and given birth to a son for Abraham, Ishmael. It is perhaps not surprising that Abraham’s domestic situation has so soon become unmanageable. But God has another effort at fulfilling his purpose with Abraham. He establishes another covenant and tells him that he will make him the ancestor of a multitude of nations and that the barren Sarai shall give rise to nations. 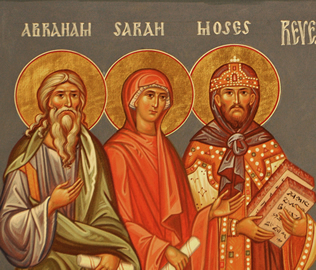 Not only does he promise this but he changes their names; Abram (noble Father) becomes Abraham (Father of Many) and Sarai (Princess) becomes Sarah, (Mother of Nations) – an irony that intensifies the foolishness and ambiguity of faith when their lived experience is so at odds with these new names. A few verses later we hear the mocking laughter of Abraham and Sarah as they laugh at their situation and the unreality of God’s covenant with them. In verses 17, 18, Abraham utterly doubts the promise and instead appeals to the fact of the son in hand, Ishmael, and is willing to rely on him as the alternative to the promised one. After all Abraham is one hundred years old and Sarah is ninety: the promise flies in the face of the facts, it is contrary to reality – this is not how the world functions! Abraham, so often presented as the father of faith is here presented as the unfaithful one, unable to trust. At this point the doubt of Abraham fits with the stubborn unbelief of the disciples in Mark’s gospel (8:14-21). They see the miraculous feeding of the 5000 and the 4000 but they understand nothing of the life-giving, future creating resources present in the person of Jesus. The failure to understand is not a matter of intelligence but of will. They do not understand because of hard hearts (6:52). In the same way, the disciples can make no sense of the call to the crucifxion or the future of the resurrection. So, in the passion sayings of Jesus (Mark 8:31; 9:31; 10:33-34) they either resist, do not understand, or quarrel about the future. At every point they fail to recognise that in Jesus the power of God is at work to create something new and independent of everything that they have known before. At nearly every point, the story of Abraham shows what a scandal and difficulty faith is. Faith is not a reasonable act which fits into the normal scheme of life and perception. In the same way the promise of the gospel is not conventional piece of wisdom that is easily accommodated to everything else. To embrace the radical gospel requires shattering and discontinuity. The story of Abraham circles about the vast question (18:14) “Is anything impossible for the Lord?” It is the question which surfaces everywhere in the Bible and it is the fundamental question every human being must answer – and how it is answered determines everything else. So in our gospel Jesus tells the disciples of the radical gospel they are not prepared to hear. He takes them, and us, beyond our frames of reference, our parameters of reason, wisdom and common sense, he takes us well beyond our definitions of reality. No wonder Peter takes him aside but here, as elsewhere in the gospel, Peter has not understood either. He has failed to recognise that the Messiah is not as he has imagined – the Call of Christ is something different. Is God’s power finally limited by our expectations? Another way of asking that could be “Is God God?” Can the world say “no” to the creator? Faith remains a scandal, challenging us at the very edges of our willingness to believe.